With over 30 years experience in glass and glazing APG supply and install glass table tops throughout Ireland. Whether you are replacing a broken or scratched tabletop, or you would like to protect your fine wood furniture with a custom piece of glass, we can help you. We stock glass and do all processing in house, keeping our over heads low we want to pass the saving on to our customers while supplying a table top of the highest quality. There are many different options when choosing our Glass Table Tops. They are available in any shape or or surround, oval, rectangular, square and custom shape cut made to measure. Table tops can be mounted on stainless steel fixings, kept clear or painted. “Opti- white” toughen glass table tops, also called Low-Iron toughen glass. The ultimate material for the finest glass table tops will be made using Opti-White Toughen glass. This glass will have all the benefits of Toughen glass, however has been made using a low iron combination of material so that it is clear with no green tint creating a crystal clear finish. Painted back toughen table tops. We create all our painted glass table tops using Low-Iron Opti-White toughen glass so that the colour will remain pure and unaffected by the traditional green glass tint. Please see our Glass Splahbacks for further information on colours and colour matching service available. Glass tabletops are ideal to help pull more light into a room and it enlarges the look of a room. Glass is very easy to keep clean and maintain. We have standard sizes, edging & polishing. We can dub the corners or bevel the glass to add extra style. We have a wide variety of choices for your dining room tabletop. Conference room glass table tops. 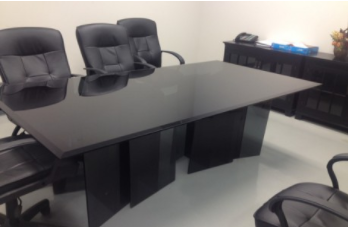 A glass tabletop for your conference room provides a clean, sharp, modern look. 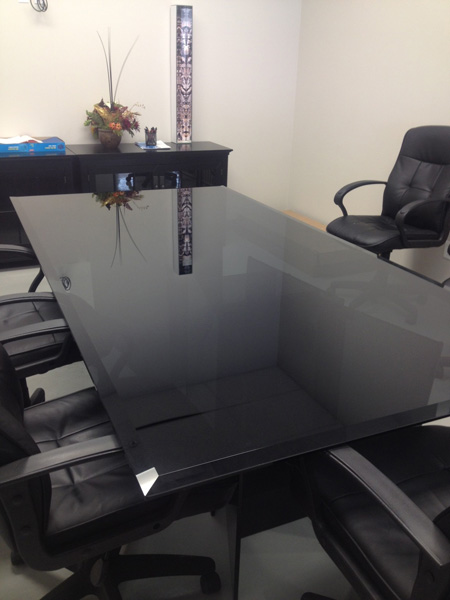 We have long glass tabletops to fit any conference room table size. We can manufacture glass table tops to any size and cut to size. “Call out measure up service/ Templating and Fitting” available where our experienced glass technicians can make a template of the desired table top area to ensure a perfect fit. We will require a template for any irregular size table tops, so that we provide glass that is perfectly fit for purpose and you and 100% satisfied. Whether we come to you or you bring a paper pattern or even bring your table to us. We can cut tabletops in many different thicknesses, shapes and colours of glass. Glass table top glass Supply and Delivery throughout Northern Ireland. Delivery of large glass table tops throughout Northern Ireland and surrounding counties. Our Courier Service will ensure safe transport of your glass right to your door step should you be unable to collect your glass from us (in a Supply Only situation). Supply Only, If you are capable of producing your own templates and drawings (complete with exact dimensions and cutout details), then our Supply Only Service will reduce costs and turn-around / lead times. Drawings and Templates can be Emailed / Faxed / Posted to us to work from. For any information on what we require to work from, please contact us. Glass Table Tops Expert Advice. Look no further than APG for the best glazing advice. Our dedicated glaziers are always around to offer help with any of your queries and questions. Rest assured you get the best advice, we make sure you leave feeling confident in the items we sell. Based in Derry City we are your local, professional and affordable glass installer, serving across Northern Ireland and the Republic of Ireland with standard or custom glass tabletop solutions. 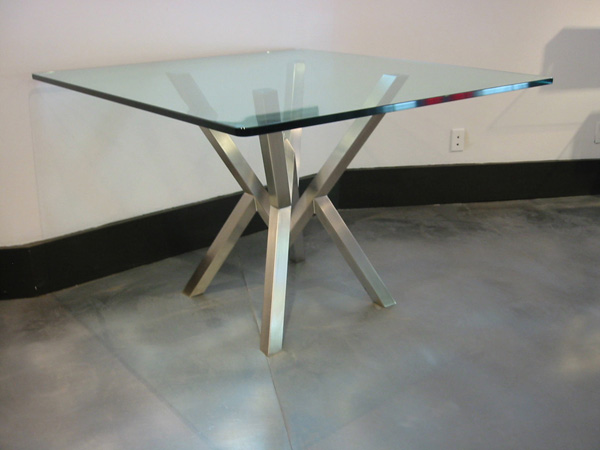 Our professional glass technicians will provide a tabletop that will fit perfectly. All tabletops are custom made and are available in many types of edges; flat ground polish and or bevelled. Unlike many companies offering bespoke glass, we have our own processing factory with the latest in glass C.N.C. technology, giving us the ability to produce glass to the highest quality in the shortest amount of time, for the lowest price. Cut out the middle man and come straight to the manufacturer.